Choosing a free public school over a private school can save parents about $9,518 per year (the average private school tuition per year, according to the Private School Review) or more — as the cost can be significantly higher in certain parts of the country (a good high school in my area costs $20,000 per year). Parents make a lot of decisions for their children, hoping to make the best choice, not only for the child's current circumstances but also for the child's future and the family's well-being. For example, when I was growing up, I knew a boy who attended a public school while his twin brother attended a private one; the parents wanted their children to develop unique identities and made this unusual (to me) choice. As for my husband and me, we chose to send our children to public schools. The schools in our area are good ones and we liked the idea of saving money on education. 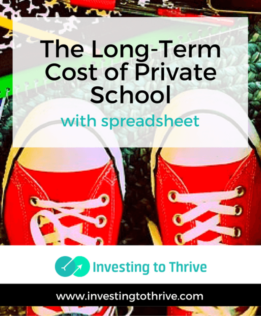 I've put together an Excel spreadsheet that can allow parents to run the numbers and let you know how much private school tuition could impact a personal balance sheet. You have two children: one is born when you are 25 years old and the second is born when you are 30. You could send both children to private schools from kindergarten through high school at an average cost of $9,500 per year per child. At the time you send your kids to school, you could (hypothetically) earn an annual investment return of 7%. Your kids will start kindergarten at age 5, graduate from high school at 17 or 18, and start college at 18. You're going to retire at 65. The spreadsheet calculations illustrate the opportunity cost of private school tuition (for elementary, middle, and high schools not private college). If you earned 7% investment returns, then you may be able to accumulate over $200,000 for each child's college fund. If you invested the money for retirement, then you may be able to accumulate more than $1.5 million by the time you retired at age 65 (and this could happen without allocating any additional money for retirement). Reality may be different than this scenario. A parent may send kids to an inexpensive private school when they are young or private school for their high school years only. An investor might not have kids at all or might have three, four, or more children. Annual costs may be higher or lower than $9,500. To get an idea of how private school tuition might affect finances on a long-term basis given your personal scenario, make adjustments to the spreadsheet. Consider projecting the future value of private school tuition payments in terms of either college savings (with a time horizon of one to 13 years) or retirement savings (with a much longer time horizon). Download the Opportunity Cost of School Tuition and customize for your own situation. Some parents may feel that paying more now for a private school could mean a better future for their children. Perhaps the right environment could allow a child to blossom academically or excel athletically, and possibly win a college scholarship — saving money in the long term. But running the numbers may bring a fresh perspective to the private school vs. public school decision. Have you sent your children to public school because of the cost?